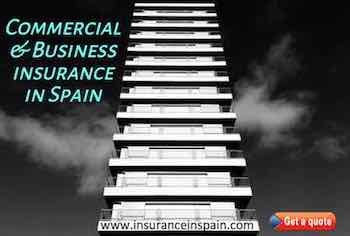 Commercial Property or business Insurance in Spain to cover you for any unexpected event and protects you from losses. PROTECTING YOUR BUSINESS WITH INSURANCE IN SPAIN IS ESSENTIAL. Protecting your Spanish business premises and assets. Insuring your Spanish business premises and assets is essential when running a business in Spain. Spain is not the same as the United Kingdom and other European Nations and starting and running a business here can be fraught with frustration, red tape, and legal issues. We recommend, as a minimum to insure yourself and your business premises and assets in Spain for losses, minimising any contingency that may occur and at the same time assisting you financially should the worst happen. www.insuranceinspain.com offers a variety of insurance products to protect your business and business assets along with earnings and associated covers. We all know how difficult it is to run and operate businesses in Spain, whether you are a hairdresser, mechanic, bar owner, rental agent, estate agent or other small, medium sized or large business. We have the insurance product to suit your needs. We know your business is important to you. Premium payments may be possible in instalments for this insurance. Please contact us with your requirements. www.insuranceinspain.com considers your insured goods at their value as new. In accordance with the terms of the policy undertaken, the insurance product will provide compensation based on the cost of rebuilding as new. The contents are insured with "as new" value for their replacement. The sum insured is updated annually, assuring you that your insured sums are not out of date and that an adequate amount is compensated for in the event of a claim. Damage due to pollution risks. Compensation of Sums Insured: If the insured value of the building or contents is too high the excess can be distributed to the other cover, to avoid a shortfall. Claims for damages on your behalf against the party causing the damage to the insured goods, in the event of risks or amounts not covered by the policy. The product offers competitive benefits in all aspects, in terms of the scope of cover, application and competitive rates. Loss or material damage to the building and/or contents. Pursuant to the limits and conditions agreed upon in the policy, direct material damage and/or losses sustained by buildings or contents are covered, including items considered as valuable objects, providing that the value does not exceed 1,800€ and items of a higher value that are expressly listed in the schedule. Fire and its effects on insured goods, in addition to expenditure incurred through the transportation of goods in order to safeguard them against fire. Explosion or implosion even if not followed by a fire, and in addition to the inevitable consequences of the event. Lightning even if not followed by a fire. Water damage and material losses due to water leaks and overflows. Location and repair of damage. Failure to turnoff taps. Vandalism or acts of disorder, including those caused by legal strikes, meetings and demonstrations in accordance with the legislation in force. Natural phenomena, such as rain, storms, hail, snow, wind and gales in excess of specified intensities and not covered by the Insurance Compensation Consortium. Flooding, as a result of the overflowing or accidental diversion of the normal route of water courses, such as canals, irrigation channels, gullies, river beds, sewers or other similar flows. Smoke damage regardless of cause, apart from damage from continuous exposure of the insured goods to smoke or damage from smoke that originates in premises other than those insured, unless it is from a fire. Impact from terrestrial, maritime or animal vehicles, in addition to impact from falling airborne objects such as satellites. The product offers competitive benefits in all aspects, in terms of the scope of cover and of application and competitive rates. Automatic cover for goods: covers, without prior notice to the insurer, a margin of 30% of the sum insured for stock. Deterioration of refrigerated stock: this covers loss or damage as a result of spoiled or rotten stock kept in cold storage, refrigeration and freezing devices installed at the insured business as a result of a breakdown of such devices or storage, an interruption of electrical energy supply or malfunction of the cold storage as a result of any risk covered by the policy. Theft with violence and theft with intimidation: includes destruction, disappearance, deterioration and damage to the building and/or contents as a result of such theft or attempted theft, in addition to cash held within the insured premises. Employee dishonesty: covers theft, fraud, diversion, embezzlement, counterfeit or misappropriation appropriation of cash, cheques, securities or goods, committed by the insured´s employees while performing their duties in your own language, and are registered for Social Security benefits in Spain for the insured place of work. Consequential Losses: Daily compensation, Loss of profit and if required as an optional item, Permanent general costs. Get a quote for Commercial Property Ins.